Hundreds demonstrated against Donald Trump outside an admin building last month. When asked if the University of Chicago is a “sanctuary campus,” a University spokesperson avoided the phrase but said several administrative offices are examining how a change in national immigration policies could affect the University and the community. 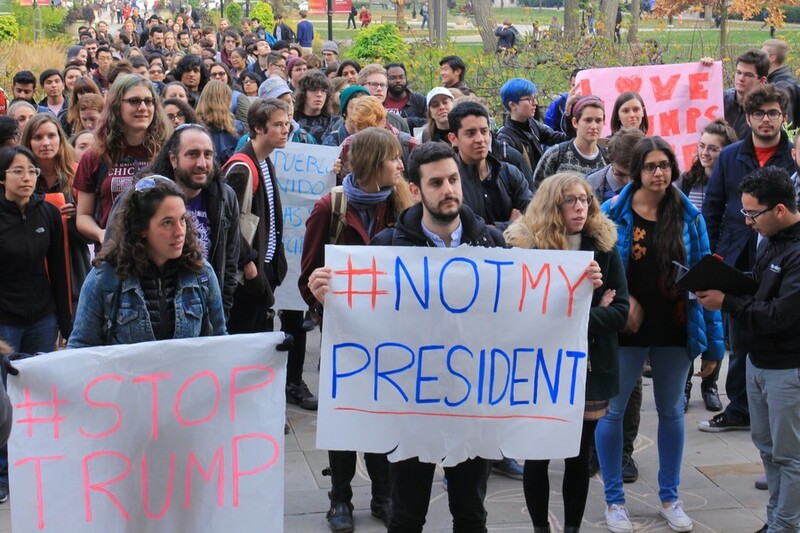 Since Donald Trump’s election to the presidency, several universities have declared themselves so-called “sanctuary campuses,” which means they will limit cooperation with federal immigration authorities in order to protect undocumented students from deportation. Trump has promised to repeal President Obama’s Deferred Action for Childhood Arrivals (DACA) executive action. Repealing DACA would eliminate work permits and protection from deportation for young people who were brought to the United States as children. Under DACA, children and young adults who entered the United States illegally and meet certain conditions are protected from deportation and may receive work permits. Obama issued the executive order in 2012 after the failure of the DREAM Act, which would have provided a path to legal status for the people protected by DACA. University President Robert J. Zimmer resisted pressure to join other college presidents who supported the DREAM Act when it was being considered by Congress. Zimmer recently signed a letter in support of DACA. Pressed again for an answer on whether the University is a “sanctuary campus” for undocumented students, University spokesperson Jeremy Manier chose not to use the phrase specifically, and referred the Maroon back to the above statement. “The administration has been in continued weekly communication over the past weeks and we hope that the new senior-level administrator task force continues to work with UCCIR as we get closer towards inauguration and beyond,” Moises Rodriguez Cruz, a representative of UChicago Coalition for Immigrant Rights (UCCIR), said. According to Manier, University personnel from the Office of Campus and Student Life, the University of Chicago Police Department, and the Office of Legal Counsel have been in contact with students to discuss concerns relevant to undocumented or “DACAmented” students. Dean of Students in the University Michele Rasmussen and Executive Vice Provost Sian Beilock plan to meet with students from UCCIR to discuss issues that the University should evaluate. “I personally applaud how responsive the administration is being, and I am glad to see the direct involvement of students that are going to be directly impacted,” Rodriguez Cruz said.